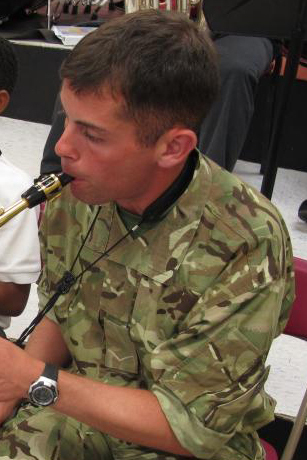 Musician Tom Cudworth is an Army Reservist cornet/trumpet player with The Band of The Yorkshire Regiment and a full-time student at York St John University, studying for a degree in Music Performance. He is currently in Ethiopia as a member of the latest Corps of Army Music Short Term Training Team, coaching musicians for the Ethiopian Defence Force Band and Ethio-Somali Regional Police Band. My initial feeling upon hearing that I’d been selected as a member of the Short Term Training Team (STTT) going out to Ethiopia and Djibouti to train the army musicians out there was one of excitement. I was going to a foreign country, I was going to be working with a team of Regular Army CAMUS musicians and I was going to be representing my country. My second thought was one of apprehension; I was going to a foreign country, I was going to be to be working with a team of Regular Army CAMUS musicians and I was going to be representing my country! For a twenty year old music student who joined the Army Reserves because it was a good part time job with good pay, regular chances to perform and it looked good on my CV, this was a daunting concept. It quickly dawned on me that this was going to be completely different to the freedom and passing out parades I’d been doing for the last year. I was going to have to quickly familiarise myself with many aspects of military life I had never experienced before because they weren’t covered on the training for Reserve musicians. As part of the team I would be helping to take the Ethiopian musicians through marching band lessons, going through manoeuvres such as crown counter marches and bomb bursts, neither of which I had done before. I was going to be away on a deployment for the first time without the security of knowing I had the direct support of the members of my own band (The Band of The Yorkshire Regiment). I was also going to have to work quite hard, which is not a concept most university students are familiar with! But I’ve never been one to back away from a challenge and as the departure date edged ever closer my excitement began to increase again. Working with a group as culturally different and diverse as the Ethiopian Ministry of National Defence musicians has been a thoroughly enjoyable experience and an interesting challenge to work through – the language barrier has been the biggest. Many times have I found myself trying to convey something in a lesson or rehearsal and failed miserably at first which has led to a whole new form of hilarious sign language evolving. After being here for nearly two weeks now I don’t know why I was so worried. Although at times it’s been tiring, frustrating and quite often bewildering, I have loved every single second. Here’s to the next two weeks. Corporal Stephen Duncombe is a cornet/trumpet player with The Band of The Parachute Regiment. He is currently in Ethiopia as a member of the latest Corps of Army Music Short Term Training Team, coaching musicians for the Ethiopian Defence Force Band and Ethio-Somali Regional Police Band. As I write this I am sitting in a cafe in Addis Ababa, drinking the strongest (and nicest) coffee I have ever had. I’m not normally much of a coffee drinker – I find it too bitter tasting – but here it is so smooth that it is hard to resist. It’s all to do with the freshly roasted beans, apparently. And the fact that coffee plants originate from Ethiopia, so they probably know best how to make it. Anyway, that’s enough coffee (maybe I’ll just have one more). Why am I here? For the past two weeks I have been working as part of a Corps of Army Music (CAMUS) Short Term Training Team, coaching musicians at the Ethiopian Ministry of National Defence (EMOND) training school. Six of us in the team are drawn from the Regular bands of the Corps of Army Music and the seventh member is from an Army Reserve band. We each specialise in a particular section of the band (cornet and trumpet myself) and the team includes a Bandmaster and a Drum Major. We are the eighth team to come out here over the past few years, at the request of the British Embassy in Addis Ababa. This arrangement benefits the Ethiopians because they receive training from experienced British Army musicians; it benefits the Embassy because they use it to build on the diplomatic relations between Ethiopia and the UK; and it benefits the Corps of Army Music, because its musicians get to travel to a new country and have a challenging and rewarding experience that builds on their musical and mentoring skills. We still have another couple of weeks out here. This coming week will see our training culminate with two events: Thursday is Graduation Day at the EMOND training school and the musicians we have helped train will demonstrate all they have learnt, by performing a marching display and a short concert featuring their various smaller ensembles. After this day, they will become fully-fledged musicians in the Ethiopian Defence Force Band and Ethio-Somali Regional Police Band. On Sunday the Ethiopian Defence Force Band and ourselves will join forces to perform for the annual Remembrance Service at the Commonwealth War Cemetery. As well as the act of remembrance, this event is an important opportunity for the British Embassy to host key figures from the various government departments and foreign Embassies in Addis Ababa, and crucially for those key figures to see us working together with the Ethiopian musicians. The following week we will cross the border into Djibouti to perform for the Remembrance Service there, this time by ourselves. The past two weeks have been challenging, sometimes extremely challenging, but ultimately rewarding and a fascinating insight into the way military music operates in another country. On our arrival the students gave us a demonstration of their capabilities, and from this, and watching their warm-up and rehearsal sessions, we identified key areas to work on. For marching band we started with individual drill and in particular ‘dressing’ (keeping in line). We got them to march without instruments and developed various hand signals to show them what we wanted (the language barrier has been quite an issue at times!). These sessions also gave us a good opportunity to acclimatise to the altitude (Addis Ababa is 2300m above sea level) and the temperature – we had to run from one end of the square to the other, in order to overtake the band and shepherd them before their counter-marches (turns)! In the section and small ensemble rehearsals our initial focus was on tuning, dynamic range (their default setting was to play very loudly all the time!) and rehearsal technique. For this we gave a demonstration of how our quintet would rehearse a piece of music – i.e. play it through from top to bottom so everyone gains an understanding of the piece as a whole; break it down into sections and rehearse them one by one, slowing the tempo down and focusing on individual instruments where necessary; recap that work and finally play the piece through again as a performance. From initially leading the section and marching rehearsals ourselves (using our developed repertoire of hand signals and key Amharic words) we have gradually taken a step back to encourage the section leaders and training staff to take ownership, in the hope that the training methods may continue to be used once we have left. One thing we have found to be particularly useful is to film the marching band rehearsals and play them back to the bands on a TV. It really grabs their attention when they see themselves on TV, and when individual errors are highlighted (diplomatically!) we have noticed a marked improvement, presumably for fear of being highlighted again in front of their peers. It has also been a learning experience for us – we have learnt that rehearsal timings can be very flexible, coffee breaks can be extended and what we would class as basic military discipline on parade is often viewed as optional. We have seen how tennis balls can be attached to metal piping to use as drum beaters, how pens can be clipped onto music stands to hold music in place, and most worryingly, how a TV power cable without a plug can be hot-wired into the mains! Even our journeys to and from the training school each day have been insightful, humbling, and terrifying in equal measure; insightful to see the residents of Addis Ababa go about their daily lives; humbling to see the marked divide between wealth and poverty; and terrifying mainly due to the lack of road markings and general driving discipline, meaning aggressive driving is key and the horn is used as a weapon! So as I sit here in the cafe with my third coffee (I decided, purely for cultural reasons, that it would be rude not to) I’m thinking of the work that is yet to be done this coming week: we need to put the final polish on the marching displays and ensembles for Graduation Day, we need to work on the music with the musicians who are performing at the Remembrance Service in Addis, and I specifically need to teach a trumpet player how to play the Last Post and Reveille. Further to that, we as a quintet ourselves need to rehearse for the Remembrance Service in Djibouti and for a visit to the local international school which we hope to fit in. It’s going to be another challenging week, but one which I am looking forward to. Finally, for those of you wondering why I’m not in many of the photos: as well as tutoring the cornet and trumpet players, my role is team photographer/media guy – I hope you like my shots! Please look out for the conclusion to this article in a couple of weeks’ time – writing it will perhaps give me the excuse for a final dose of Ethiopian coffee at the airport. For more updates on our work here in Ethiopia follow the Corps of Army Music on Facebook and Twitter. For more information about the work of our Short Term Training Teams in general, visit CAMus on the British Army website. Photographer: Corporal Stephen Duncombe; Crown Copyright. Warrant Officer Class One Mick Latter has been involved with Army Music for 28 years and retires in a few weeks time. 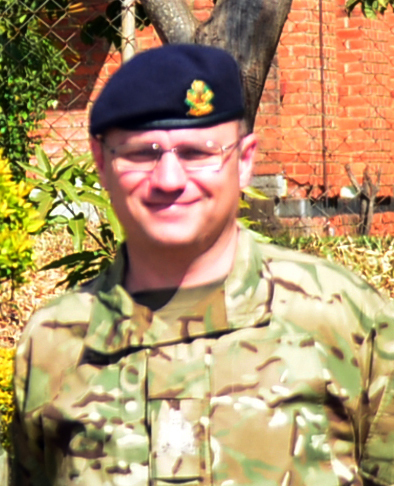 Following a successful career in the bands reaching Band Sergeant Major of the Band of The Royal Logistic Corps his last role was Head of Digital and Media Engagement for Army Music. He volunteered to support this task to the continent of Africa as a performer on the French Horn and as media support officer for the deployment. As the saying goes ‘One last time with feeling’. 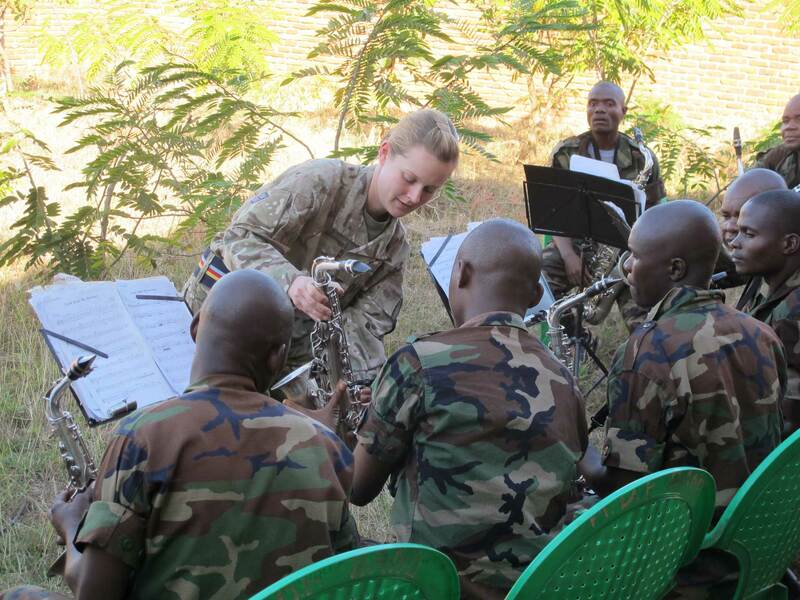 The Corps of Army Music recently deployed a Short Term Training Team to Africa. The aim was to supply musical training and defence diplomacy work at key events through music across a number of countries; South Africa, Mozambique, Malawi and Zimbabwe over a period of less than 2 weeks. I saw this as a personal opportunity to visit a number of countries I had yet to visit and probably a once in a lifetime experience and opportunity but it would also give me the opportunity to obtain and generate good quality media and publicity for the Corps of Army Music as it develops this area of its capability. The Corps of Army Music is directed to supply a number of Short Term Training Teams for countries around the world. Over the last 12 months we have covered Kosovo, Bosnia, Gibraltar, Bermuda, Lebanon, Ethiopia and Kuwait. The team of 8 musicians, led by Director of Music Major Lawrence Sale, was made up from 5 other members of the Corps of Army Music and two musicians from two Army Reserve Bands; The Band of The Yorkshire Regiment and the Army Medical Services Band. 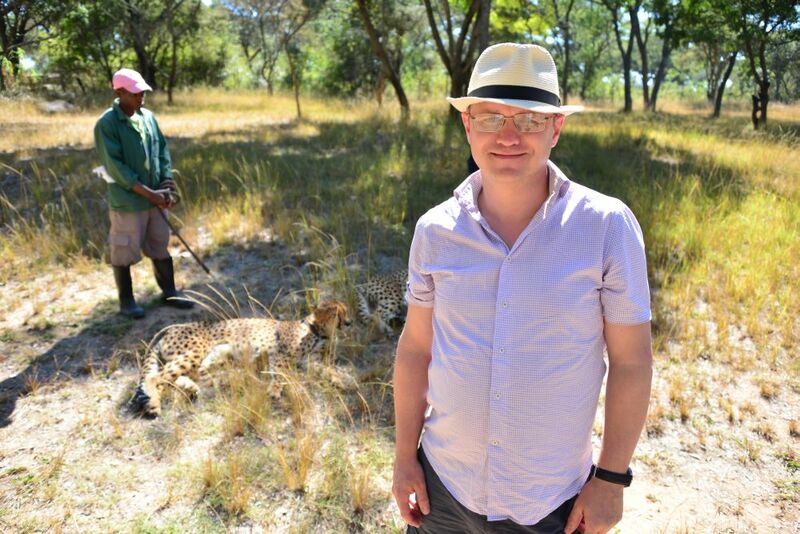 Three members stayed in Johannesburg to plan for events later in the trip and 5 members that made up a brass quintet drove to Maputo in Mozambique, a 7 ½ hour drive through the stunning open plain territories of South Africa and Mozambique. 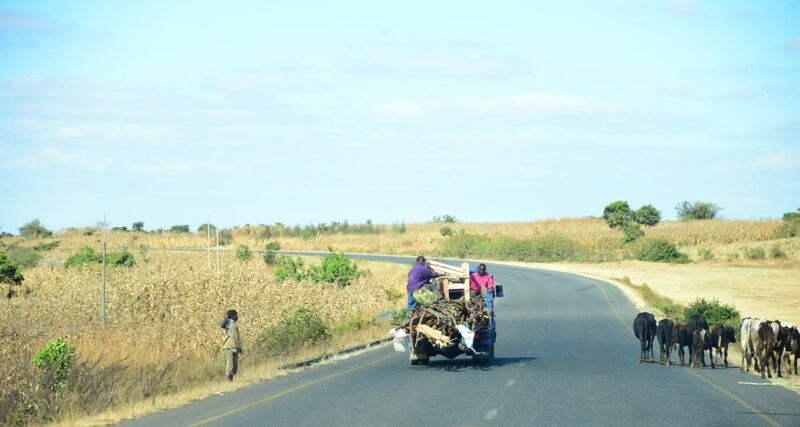 We hit the city outskirts of Maputo as dusk arrived, the traffic was building up and we took our lives into our own hands as we fort our way through the chaos and mayhem of the roads of Maputo. Overloaded minibuses, open backed trucks with people on the rear sections, large heavy trucks and very little accurate road signs. At one particular junction a triple articulated lorry decided to run one of our two vehicles (the one I was in) off the road either oblivious to us or no care! We arrived at Hotel Cardoso on the North side of the city and checked in feeling exhausted and pretty grubby after traveling by air and road for nearly 24 hours. 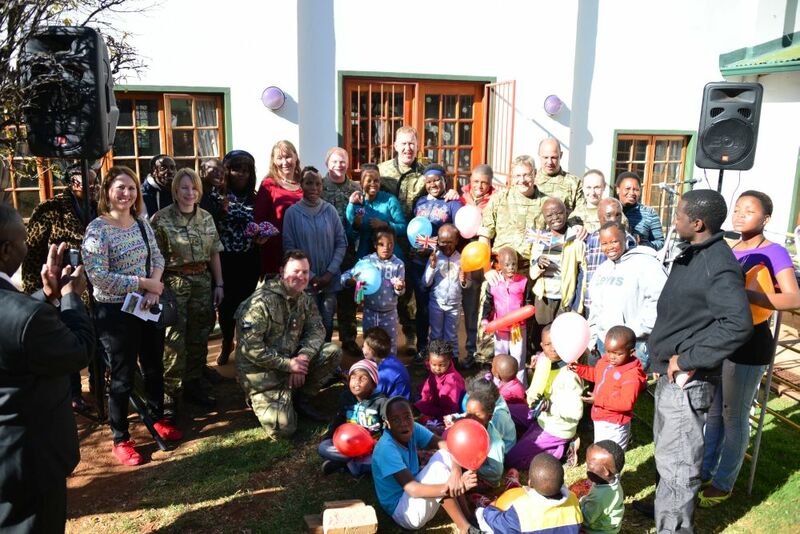 We sat down with our hosts from the Defence Attaché’s office for South Africa, Wing Commander Cookson and his wife for a nice meal and a few light drinks before settling in for the night in very welcoming hotel beds. 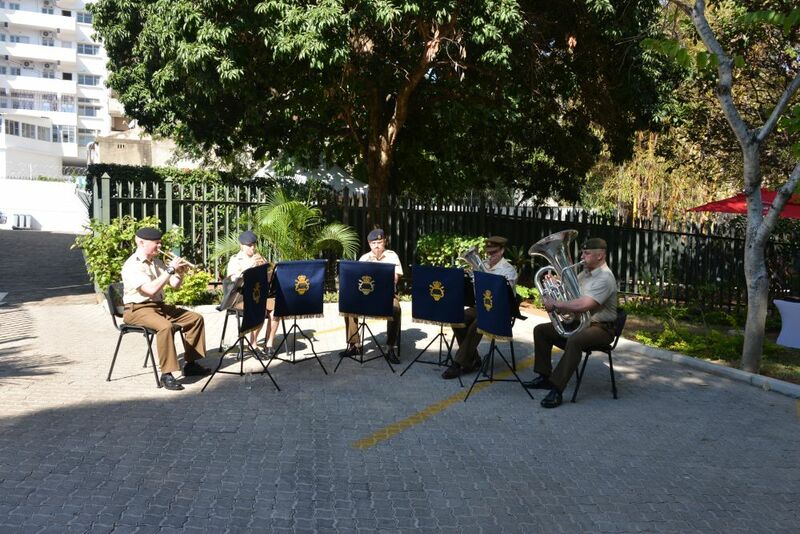 Next morning the brass quintet set off to support a Queen’s Birthday Parade event at the High Commission in Maputo, hosted by the High Commissioner, Joanna Kuenssberg. The High Commissioner had invited a number of key political and business influential people to the cocktail party that was taking place in the gardens of the High Commission. We were there to supply background music and add a ‘soft approach’ influence to the event and most importantly perform the National Anthems for Mozambique and Great Britain. Staff Sergeant Ben Ruffer was in charge of music and had sourced and arranged for the quintet the Mozambique National Anthem. His research had paid off as it was the correct version and many of the guests thanked the quintet in person for a fantastic performance of their Anthem as they had heard it many times before performed in not such a professional standard. The High Commissioner thanked the quintet after the event. She was very happy that our musical input had made a valuable contribution to the event and looked forward to future events supported by the Corps of Army Music in the years to come should we be able to do so. Lieutenant Brendan Wheeler the leader of the quintet then presented her with a Corps of Army Music plaque. On our return to the hotel we quickly changed out of uniform and drove down to the coast to admire the Indian Ocean and taste some local food and beer. The Maputo local award winning beer is called 2M for anyone considering travelling to the area. That evening our host took us to dinner in an excellent local curry restaurant of all things to eat in Africa. Being military musicians curry is more often than not a favourite amongst all so there were no complaints and the food was indeed excellent, thank you Wing Commander Cookson. Next morning was an early start, up at 5am for departure promptly at 6am as we had to make the return drive to Johannesburg, another 7 hours by car. Our next event was planned in Johannesburg at 5pm that evening so we could not afford to be late and we had to clear the city traffic before it built up with the masses arriving to take up their jobs in the city centre. First turn following the route on our Satnav led us to be facing traffic coming directly towards us on what we thought was our side of the dual carriage way. There were no signs stating no entry, one way or any other related sign but clearly in the morning the system was designed to be traffic heading in only on this particular dual carriage. After several cars flashing us and one near head on miss we soon realised we were in the wrong so quickly turned left to find an adjacent road heading in the direction we required out of town. We located the main road out and then weaving through the traffic were on our way but with another near miss where a local minibus taxi decided to dive down the inside of us catching our driver a little off guard, but a quick swerve to the right avoided what looked like an inevitable collision, a time delay we couldn’t afford. The drive back across 100s of miles of wilderness scattered with an occasional some town led though some beautiful scenery and landscapes and even the opportunity to spot a family of baboons who had crossed the road a little in front of us. The next event, or as musicians like to call them ‘gig’, was in support of the promotion of the forthcoming 2015 Rugby World Cup which as I am sure you all know is being hosted in the UK. With the home of Army Music located at Kneller Hall, Twickenham, right next door to the Twickenham Stadium, Rugby Football Union offices and the head office for the Rugby World Cup this was an event we had to support and indeed wanted to support and a good relationship builder with communities outside of the military. 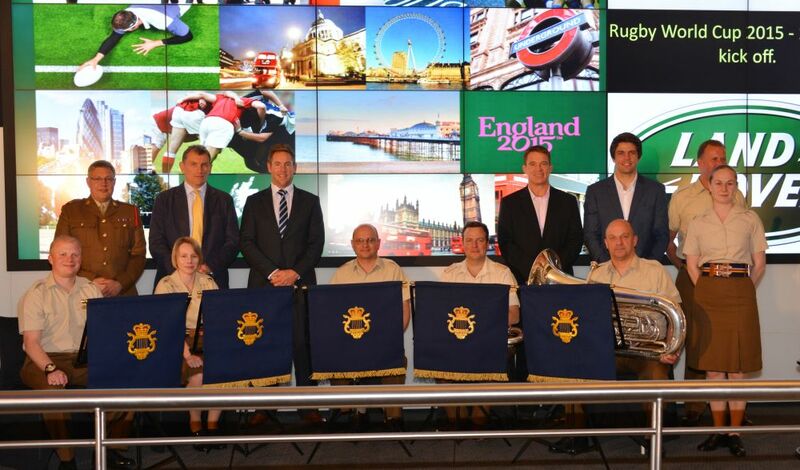 The event was held in the Johannesburg Stock Exchange and hosted by the British High Commission. A number of the South African International Rugby Squad were on hand to raise the profile of the event and our quintet added some musical colour to the evening. The team took the photo opportunity with a number of the rugby players and this included gate crashing the stage for a quick group photograph. Next morning the team had to move cities to support a Dinner Night reception for the British Peace Support Team. Self-driving with the world’s worse SatNav the team moved by road from Johannesburg to Pretoria taking approximately 2 hours. On arrival in Pretoria we settled into our third hotel and prepared our uniforms for tonight’s gig at the Pretoria Country Club. The event was a dinner for the British Peace Support Team and guests including various Defence Attaché staff from South Africa and neighbouring countries. The Brass Quintet opened the evening, while guests drank cocktails at the entrance to the Country Club, performing a couple of pieces of music including the theme from Dambusters. The quintet were then joined by a local Bagpipe and drums group who performed the classic ‘Highland Cathedral’ tune with the quintet. This was really appreciated by the guests and the bagpipers were excellent; we only had one 5 minute rehearsal prior to performance with them! The most important element of any dinner night in the military for the musicians is the performance of National Anthems and any after dinner music. In this case we had to perform the South African National Anthem, the British National Anthem and a rendition of Post Horn Galop performed by Staff Sergeant (Bandmaster) Ben Ruffer. Next morning after an early start the team had to move by air to Lilongwe in Malawi. Traffic from the city centre of Pretoria to the airport was a bit of an issue especially with our under powered 4×4 vehicles. Arriving at the airport the accompanying Defence Attaché staff organised the excess baggage allowances and we made it through customs and on to the departure gate with minutes to spare – then the flight took off late, typical. With clear skies we could see out of the windows of the plane to the African landscape below. What struck me was that it is far greener than I imagined it would be. On arrival Major Lawrence Sale and I headed off to Recce an event while the rest of the weary team settled into hotel number four this week. Next day the team set off for the barracks in Lilongwe where one of the two Malawi Defence Force Bands are located. We were met at the rehearsal location by their director of music, Captain Levi Chisambi. Captain Chisambi was musically trained to lead the band at the Royal Military School of Music the home of British Army Music at Kneller Hall for four years and then completed a six month command course at the Royal Military Academy Sandhurst before returning to Malawi several years ago. I personally remember Captain Chisambi from his three year course at Kneller Hall as I was a member of the staff during his period there so it was good to catch up with an old acquaintance. The first part of the morning was spent running a couple of pieces under the baton of Captain Chisambi so the team could hear and see what level the band was at. This is a repeat visit for the Corps of Army Music as a team had visited the band 12 months previously. The band were able to hold a piece together and with some of the players only having started on certain instruments some weeks before the best plan of action was deemed to be to break the band down into smaller sections with each of the team members, who are specialists on their instruments, taking the Malawi musicians away to practice the music and develop key skills. An hour later the band reformed to see if any progress had been made, remembering that in some cases the musicians had only been learning their instruments for a few weeks! The Band then performed the three pieces under the batons of Major Lawrence Sale, Lieutenant Brendan Wheeler and again Captain Chisambi. The Band performed ‘I Know Him So Well, Serenade and Scarborough Fair’ which was an arrangement by Captain Chisambi. After lunch the band and the team took to the main square and under the direction of Staff Sergeant (Drum Major) Shaun James (who by this stage had been nick named ‘Susat’ after the British Army’s rifle optical sight due to his shocking reading glasses) of the Army Medical Services Band undertook some drill and marching band practice. The temperature was in the high 20’s but this did not seem to bother the Malawi band some of which had jumpers on! Staff Sergeant James added a degree of humour to the training with the threat of a late night drill session with him at 2300hrs for all those you could not comply with his orders and instruction. The rehearsal included marching the band as a whole on parade and to help demonstrate the drill movements required to change direction and halt five of the team formed the front line of the band and led in the early part of the rehearsals. The Band learnt quickly and very soon a marked improvement could be seen. Finally the band performed on the march with music and without members of our team leading the way. By the way Staff Sergeant James did not order anyone back for late night drill sessions on this occasion. After marching band the team’s brass quintet gave a short recital to demonstrate some of the performance points we had given during the day. This was concluded with a performance of the Malawi National Anthem with the quintet playing and all the Malawi band singing, quite a sound. The Band were excited to have us training them and the end of the day was a frenzy of thanks and many photographs taken and new friendships made. Strange thing was we are due back there in two days so we could expect much of the same excited enthusiasm. But we enjoyed it and were keen to return. 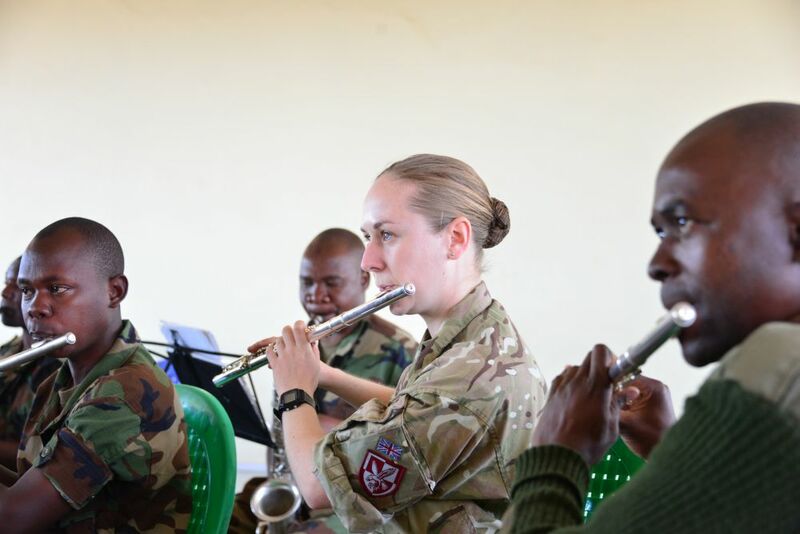 Two days after our first visit to the Malawi Defence Force Band the team returned to continue the training programme and help develop the musical capability of the band. 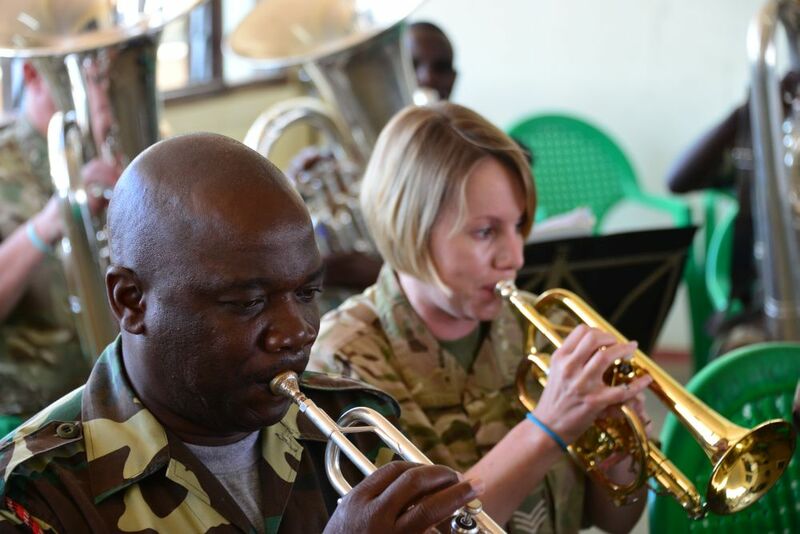 We started again in the practice room this time with two new pieces and the under the direction of Lieutenant Wheeler and it was soon apparent the Malawi Defence Force Musicians were learning very fast, a good sign that they were taking on board what we were teaching them. We also took the opportunity to meet and talk to several senior Officers of the Malawi Defence Force and discuss future possible plans to assist the band and how they could help the band develop with small investments. We concluded the training with a further marching band session once again under the direction of our very own Drum Major Shaun ‘Susat’ James, but this time the Malawi Defence Band Drum Major led the band. She soon took on board the advice and guidance given to her and the bands drill and movement across the parade square was improving all the time. Training with the Band was very rewarding and all the team members hoped to be able to return to Malawi in the future. Some 500 guests were invited to this event hosted by the British High Commissioner and the teams brass quintet was lined up to support the event and our very own one man band saxophonist Staff Sergeant Shaun James and his backing tracks. After the cocktail party a local band had been booked to supply music for select guests including the team. Members of our team even joined in with the band. Major Sale our resident drummer was soon leading the rhythm section and clearly enjoying the moment on stage as a performer. After a 10 hour drive in three vehicles to Harare in Zimbabwe the band settled into the hotel for the night. The drive was an experience; poor roads, long winded boarded controls (my passport now has more stamps in it than I ever thought I would see being a European), various animals from chickens to cattle stepping out in the road. There were a large number of locals walking from one village to another or in some cases cycling what seemed to be extremely long distances. On coming very large trucks were also a concern and at times we had to take evasive measures to avoid them including leaving the road completely at about 60mph as we came round a corner to find several very wide loads coming towards us spread over both lanes. Anyway we made it safe and sound and in one piece. 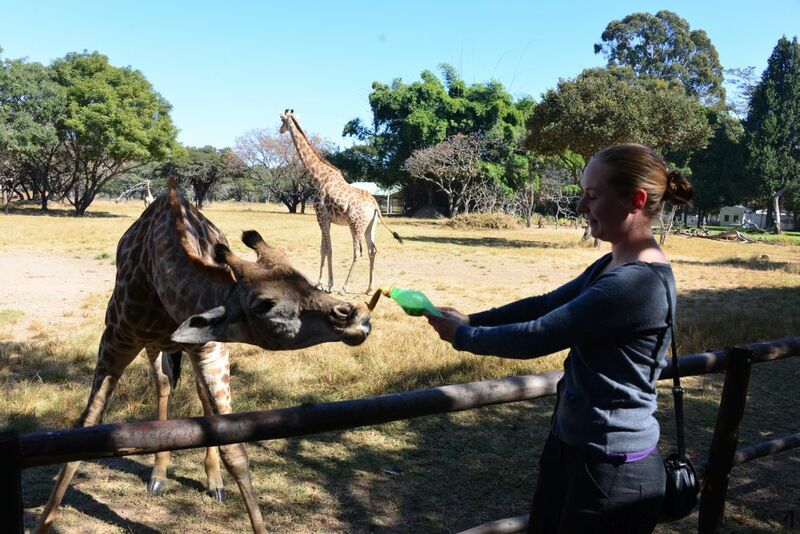 The next morning the team visited Wild is Life Animal Sanctuary just outside Harare. This place is magical, more like a personal home with many endangered species roaming freely. More dangerous ones like lions were behind wire but you could get right up next to them. The sign clearly said we cannot rescue your fingers from the lions but we all came away with them all intact, I think. Other animals at the sanctuary included a baby elephant called Moyo who had a dog and a sheep for companionship. Moyo was introduced to us in person and loved you to blow down his trunk. We were warned though that he could if he wished knock you over and if you put your fingers in this mouth it would be like slamming your fingers in a heavy door. There were also a number of really friendly giraffes and baby giraffes which you could hand feed. Other big cats you could get up close and personal to included two cheetahs who contently laid just a couple of metres from us with their keepers purring away like a domestic cat. 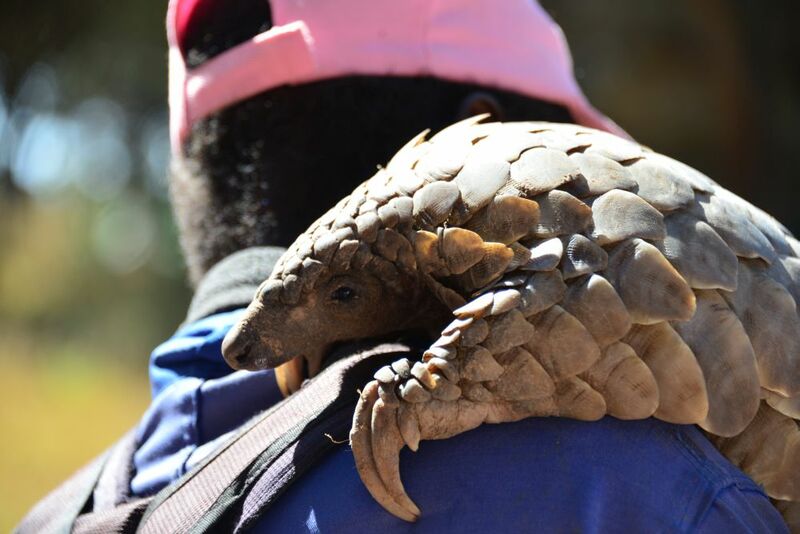 Their sanctuary’s pride and joy is a rare Pangolin, a strange creature with large scales on its back who lives solely on ants. This animal is so rare and valuable that it is cared for 24 hours a day and when it goes off to hunt for ants up to 8 hours a day a keeper carries it and when stands by it at all times. The relationship between the Pangolin and the keeper is clear to see. The next musical event we were supporting was at the British High Commission Residency in Harare. The event was another Queen’s Birthday parade cocktail party in the stunning grounds of the home. Hosted by the British High Commissioner who had recently had an audience with the Queen in London this was major event for UK diplomacy and relationship building in Zimbabwe. This was also the first time in over 12 years or more that British Soldiers had undertaken any activity in Zimbabwe. It was originally planned that our team would be engaged with community activity and training of Musicians in the Zimbabwe Army but due to political reasons this had not been secured but the British Defence Attaché was fairly confident that the bridges may have now been developed to encourage engagement for future years. The Brass Quintet’s major task at this event was as usual to entertain guests, network and encourage defence engagement at the lowest level and perform the National Anthems. The unusual element of the Anthems this time was we were to perform them with choir of approximately 20 members of staff of the British High Commission in Harare. The choir members were all amateur singers and had come together about 2 months ago and along with our quintet did a sterling job. The next day the team left the hotel early for the Harare airport for a return flight to Johannesburg. We boarded a small plane with only 30 seats and wondered if all our equipment had actually fitted in the hold. We joked with Major Sale about the Drum Major’s Mace and box which is over 7 feet long was strapped to the wing or roof of the plane; Major Sale is not a good air traveller so this may not have helped. We were on a tight schedule today and it was going to be a long day. Major Sale had met a lady on the flight over who worked at a charity in Johannesburg called Children of Fire. This charity looks after badly burned children many of which the families are unable to care for or their injuries are so live threatening they could not possibly continue to live in some of the poor conditions many South Africans live in in the various shanty towns. The children were often injured from house fires but in some cases deliberately burnt. Lieutenant Wheeler led the Brass Quintet as we played various pieces of music for them and demonstrated the instruments which included getting the children involved. On hand again was our very own saxophonist Sergeant James who the children played as he performed several famous pop ballads. At the end of the performance we mixed and chatted with the children and Sergeant Marsden of the Band of the Yorkshire Regiment an Army Reserve Band had many of children intrigued by his Tuba, the largest instrument within the team. The Children had also made various British Patriotic Cakes for us to eat including enormous doughnuts with Union Jack flag designed icing. In a small way we hoped make their lives a little happier if only for a brief time. This was to be my final gig in the Corps of Army Music after 28 years, supporting a Dinner to mark the 200th Anniversary of the Battle of Waterloo. The dinner started with a speech about the actual battle of Waterloo and then we performed a number of pieces of music with various European and British famous pieces of music to suite the theme of the dinner. At end of the Dinner we performed the famous Post Horn Galop, due to the misplacement of the actual post horn it looked at one point that we would not be able to perform the tune. But the event was being held in Light Horse Regiment HQ in Johannesburg and the building was home to a military music museum and Sergeant Ruffer spied something that would suit his needs the bell section of a fanfare trumpet. At the end of the dinner I was mentioned and thanked in the speech for my service to Army Music for the last 28 years and the fact that during this tour I had been notified that I was to receive the Meritorious Service Medal something I never expected to receive and I am extremely proud to be receiving. The musicians with me on this epic trip had one last touch to mark my last musical event in the Corps of Army Music and they struck up with the tune Auld Lang Syne, it seemed I had slightly hijacked the end of the dinner! I am not quite leaving the Army as I am I am joining the Army Reserves as a Digital and Media Specialist later this year with the newly formed 77x Brigade, something I am very much looking forward to. So I may be writing further articles and blogs in the years to come for the British Army as I continue to travel around the world. 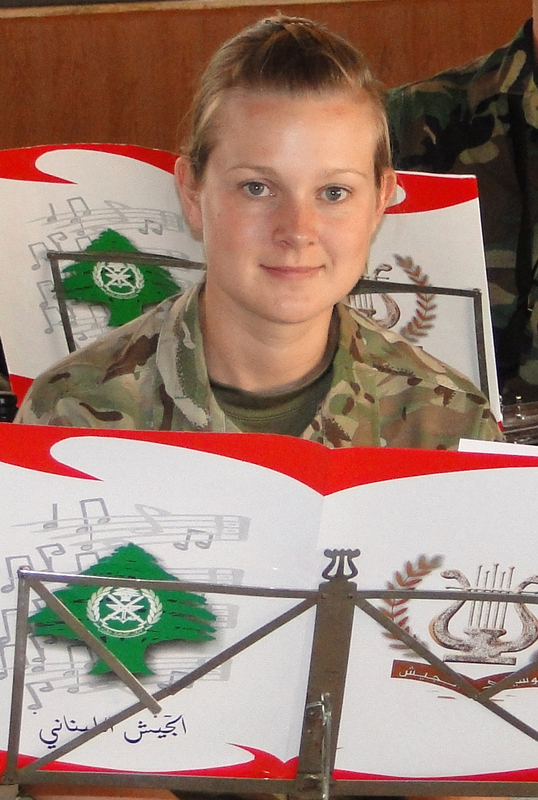 Corporal Kat Brydon talks about the latest visit by the latest Corps of Army Music (CAMUS) training team to the Lebanon. On Monday 18 May 2015 a group of five CAMUS Musicians embarked upon a Short Term Training Team (STTT) visit to Lebanon together with Pipe Major Josh Bruce from the Army School of Bagpipe Music and Highland Drumming. 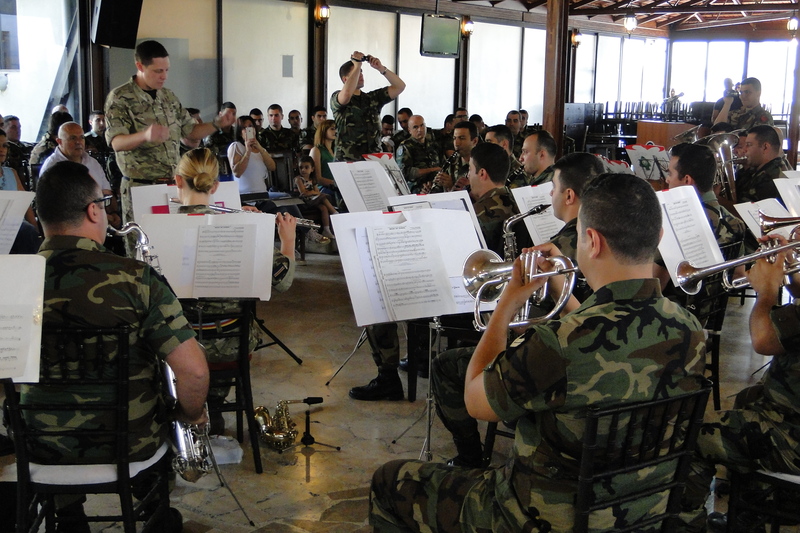 The main focus of the trip was to work together with the Lebanese Armed Forces (LAF) Band to assist them with their musical training and development. In recent years CAMUS musicians have travelled to several nations in Europe, Africa and the Middle East to deliver similar STTT packages, but this was their first visit to Lebanon; a country which has a very turbulent and colourful history. Currently Lebanon’s Capital Beirut is undergoing major redevelopment and is relatively safe for foreign visitors to explore but much of the country is suffering from terrible violence spilling over from the conflict in neighbouring Syria. The team received a very warm welcome from the band and was entertained with a performance of two of the band’s favourite pieces. The Team set to work with a full band rehearsal using some familiar repertoire which they brought with them from the UK under the direction of the team’s leader Warrant Officer Class One (WO1) Bandmaster (BM) Rob Smith. The band was then split down into sections for some more instrumental specific training with Tuba expert Drum Major (DMaj) Jason Bate, Cornet specialist Sergeant Stuart (Casper) Roberts, Woodwind specialist Corporal Kat Brydon and Percussionist Musician Ben Matthews. WO1 Smith also delivered conducting master classes to the LAF’s Directors of Music, who needed to quickly familiarise themselves with the scores to the new repertoire brought from the UK. As well as working on their concert wind band repertoire, the LAF Band were keen to expand their marching band and drill capabilities. They were given a fun session of marching band instruction under the guidance of DMaj Bate where they practised new manoeuvres. One of the main priorities of the STTT is to assist in the establishment of a new bagpipe capability within the LAF Band. This was delivered by Pipe Major Bruce to the LAF musicians who had been specially selected to learn the pipes. They started by learning to build their own set of bagpipes from their component parts and then made incredibly rapid progress in learning to play the pipes. On Saturday the STTT visited a community based, non-profit music group called The Lebanese Band Association for the Promotion of Music (LeBam). The team were delighted to find that the group had many gifted and enthusiastic musicians, drawn from all sections of the Lebanese community. They come together each week for structured instrumental lessons and band practice. The group’s instructors were very pleased to show the team around the facilities and let them sit in and observe the instrumental lessons, before being entertained by a rousing bagpipe recital from Pipe Major Bruce. Some of the children even had the chance to try out the bagpipes which caused much amusement. After the weekend break it was time to get back to work with the LAF Band and do the final rehearsals and preparation for the concert which took place on Wednesday 27 May at the Officers’ Club in Jounieh, a coastal town slightly to the north of Beirut. 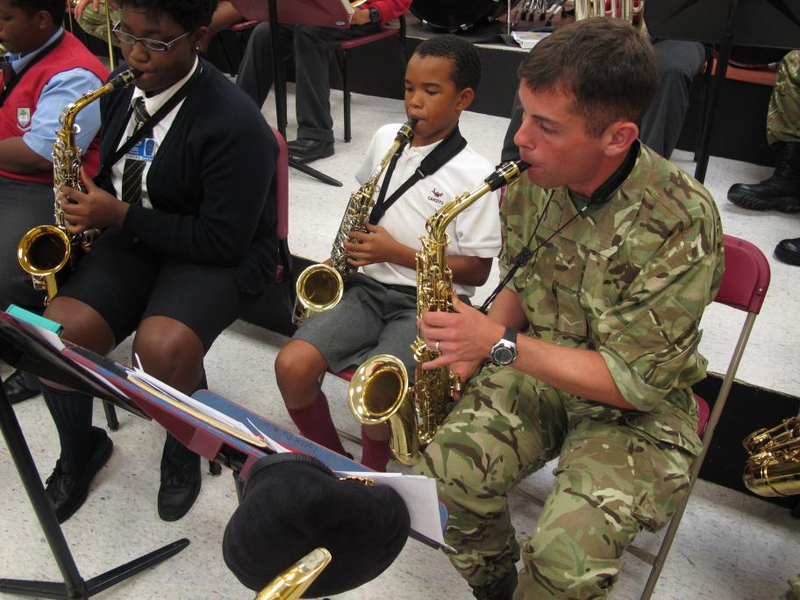 The concert was the culmination of all the musical training carried out in the previous week and featured performances by the band’s newly created saxophone quartet, woodwind quartet and brass group amongst concert wind band pieces including Bohemian Rhapsody and Pirates of the Caribbean. The new bagpipe ensemble performed the traditional favourite Amazing Grace which was a remarkable achievement considering they had only had the pipes for a week. After the concert the STTT were invited for a buffet lunch with the LAF Band’s Officers and then they said their farewells to the band members who had become good friends over the past week. The team returned to the UK after a very successful period of training with the LAF Band. For Army musicians it is a great privilege to have such an opportunity to travel to other countries and connect with so many people both military and civilian who share their passion for music. Through their hard work and enthusiasm the LAF Band achieved a huge improvement in performance standard in a very short amount of time and it was a privilege to be part of this CAMUS STTT. 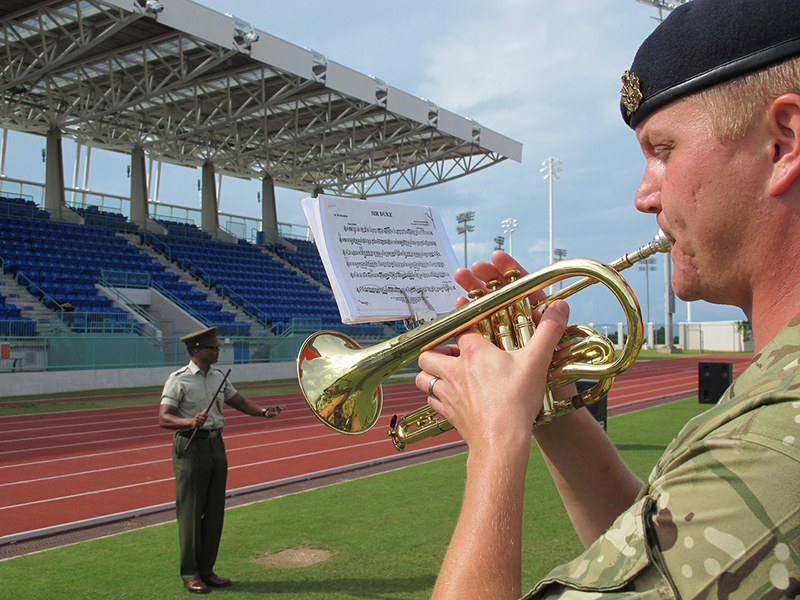 Musician Lance Corporal Paul Dove talks about working in Bermuda as part of a Corps of Army Music training team. Army Musician Lance Corporal Paul Dove. Bermuda. A tiny island located in the North Atlantic covering an area of 20.6 miles2 with a coastline of just 75 miles. Home to Bermuda shorts, whistling tree frogs, pink sand beaches, the Bermuda onion, the world’s smallest drawbridge and, for the next 18 nights, a Corps of Army Music (CAMUS) Short Term Training Team (STTT). The team was made up of personnel drawn from all over CAMUS and included Warrant Officer Class One Bandmaster Matt Simons, Drum Major Alistair Smith, Musician Mattias Andersson and me, Lance Corporal Paul Dove. Bermuda has always held close ties with the UK as a member of the Commonwealth. 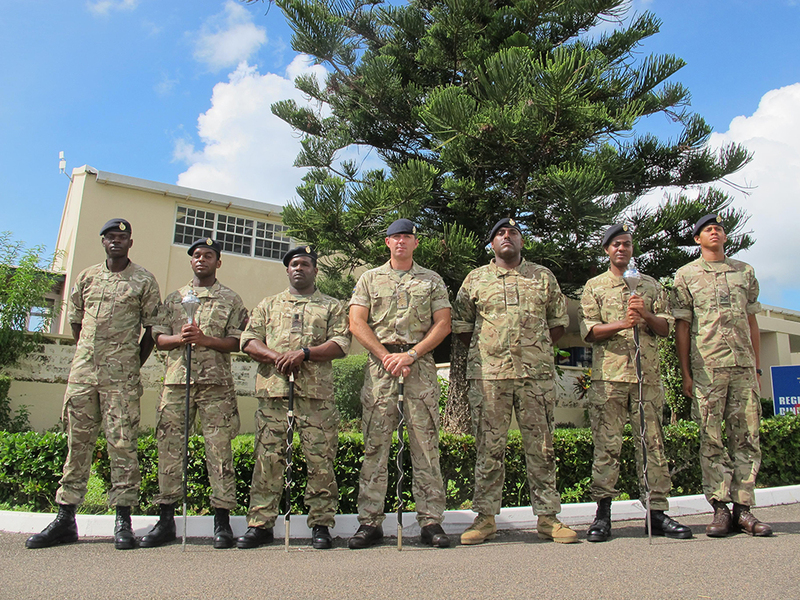 In particular, The Bermuda Regiment is closely linked to the Lincolnshire Regiment and its successor The Royal Anglian Regiment, specifically the 2nd Battalion, who often provide training in various guises. CAMUS provide STTT’s in direct support of the Army’s core purposes of ‘contingent capability for deterrence and defence’ and ‘overseas engagement and capacity building’ as outlined under the current Army 2020 plan. 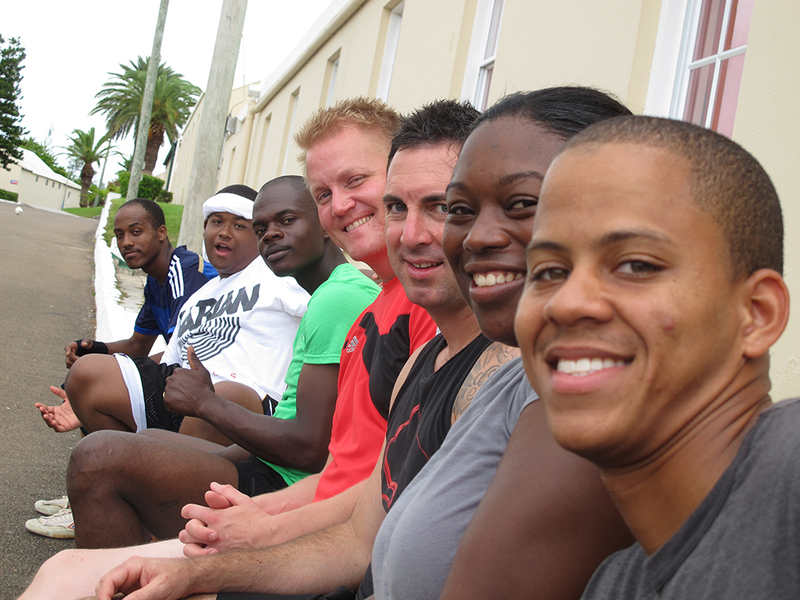 Our team was in Bermuda to support and help train The Band and Corps of Drums of the Bermuda Regiment, the ceremonial face of The Bermuda Regiment. In the same way that Army Reserve Bands are required to complete an annual camp, our deployment was to coincide with the Band’s annual two-week camp. Drum Major Alastair Smith with the current and potential Drum Majors of the Bermuda Regiment Band and Corps of Drums. On the 26th of September after a seven hour flight from London Gatwick, the team touched down at Bermuda airport at 2200 hours local time. We were met by Major Dwight Robinson, Director of Music of the Bermuda Regiment and a former resident at Kneller Hall having graduated from the three year Bandmasters course held there in 2003. 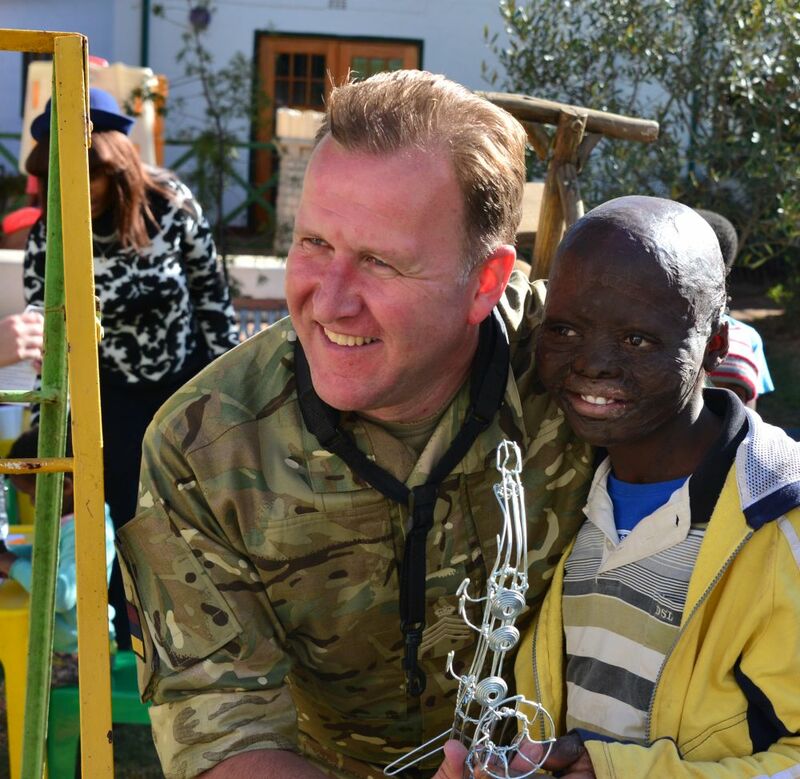 Accompanying him was the Band Sergeant Major, Warrant Officer Class Two James Van-Lowe. Serving over 30 years in the Regiment Band, WO2 Van-Lowe was no stranger to UK military music having completed his Band Sergeants’ course at the Royal Marines School of Music in Deal, Kent, in 1986. After settling in at Warwick Camp and spending a day acclimatising at Bermuda’s famous Horseshoe Bay, we eagerly awaited the arrival of the Band and Drums members. Indeed, when they arrived, there were a few more familiar faces, Cpl Paul Smith and LCpl Kallan Thomas who had both completed training at the Royal Military School of Music, Kneller Hall. Within the first few days we were introduced to the Regimental Sergeant Major WO1 Gavin Rayner and the Commanding Officer, Lieutenant Colonel Michael Foster-Brown, a serving British Army officer originally from The Royal Green Jackets (now The Rifles) Regiment. They were both extremely pleased to have us on the Island and made us feel very welcome. Within hours of the Band starting their annual camp, I found myself on an engagement at the Bermuda Cathedral in Hamilton with the rest of the STTT. The event was to commemorate the start of WW1 and pay respects to the fallen and in particular, fallen Bermudians who had served in both world wars with the British Army. Throughout the two weeks, the team also took part in the South Shore Serenade each day. This involved marching out of the Camp and performing to the morning and evening traffic on one of Bermuda’s busiest roads and, on occasion, marching round the local residential areas in Warwick. Me working with pupils of the Bermuda Youth Orchestra at Cedarbridge Academy. One of the most rewarding engagements we took part in was at Cedarbridge Academy. 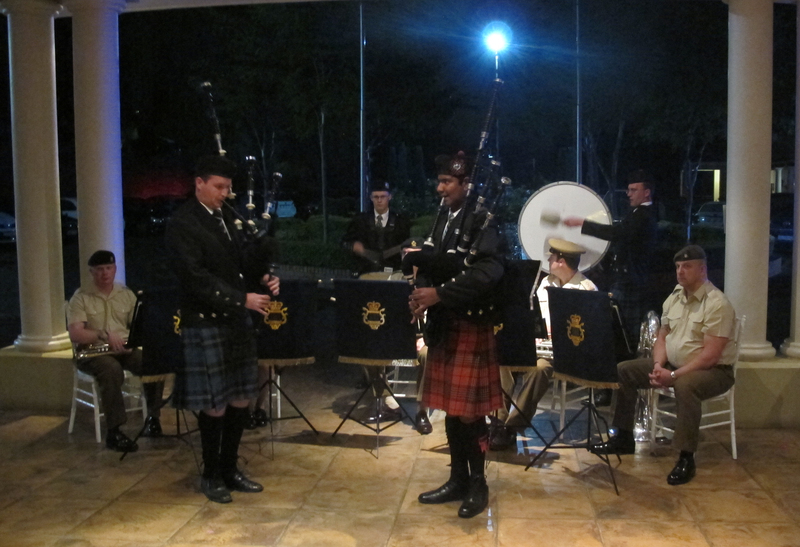 Here we helped the Band strengthen its relationship with the Bermuda Youth Orchestra, a source of possible recruits for the Band. The team spent some time with their individual sections, instructing on basic musicianship principles. This also helped to show some of the Regiment Band members how to run sectional rehearsals, a skill that would come in useful. The Band also performed at the Bermuda Police Service (BPS) parade, marching through Hamilton to celebrate the Service’s 135th anniversary and also publicising the upcoming Tattoo performance. One of the aims of the next couple of weeks for the Band and Drums was to prepare for the BPS Tattoo. 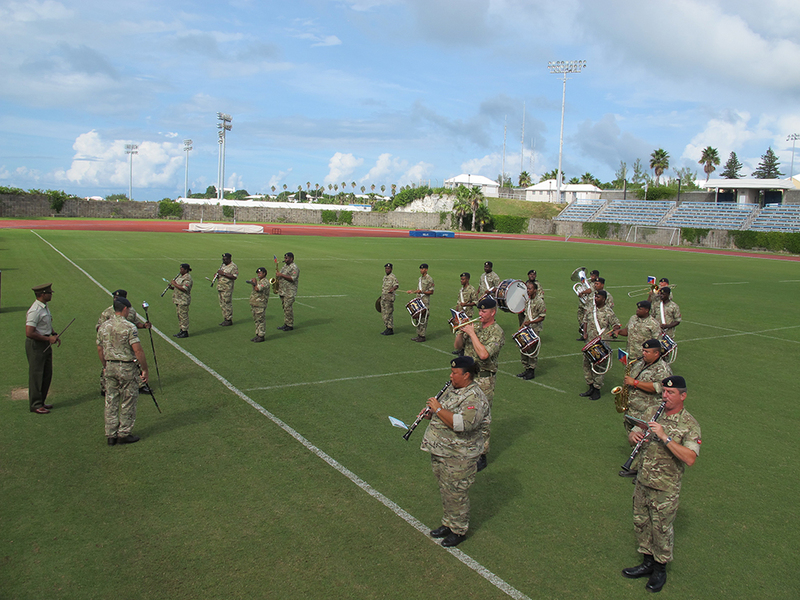 This was to be an extravaganza involving a massed Bands performance with the Royal Bahamas Police Force Band, The Somerset Brigade Band (a band primarily made from ex-Bermuda Regiment Band members) and the Bermuda Islands Pipe Band. Before all this though, the STTT were required to assist in designing a display for the Bermuda Regiment Band. Musn Mattias Andersson performing at the Bermuda National Sports Centre. Drum Major Smith took charge of designing a display for the Band and Drums and rehearsals were plentiful and included lessons on band drill, instrument deportment and musical rehearsals on the parade ground. Drum Major Smith also put some of the members of the Band and Drums through their paces with some basic Drum Major tuition. The Band and Drums have traditionally attended the Drum Major course held at The Army School of Ceremonial in Catterick and after Drum Major Smith’s lessons, there was no shortage of volunteers. WO1 (BM) Simons, assisted Major Robinson with rehearsals on the Tattoo music which included challenging pieces for the Band such as the 1812 Overture, and Stevie Wonder’s Sir Duke. In amongst these rehearsals, and in between the Band’s military training, the team delivered lessons on music theory and basic musicianship principles, an experience that I found quite daunting as I had not previously taught music theory to a large audience. However, the Band was very receptive to our efforts and enjoyed our sessions with them. During these rehearsals, we received a visit from the Governor of Bermuda, His Excellency, the Honourable George Fergusson and Bermuda’s Premier, Mr Michael Dunkley. They spoke to members of the team and Band and were very appreciative of all our efforts over the last few days and looked forward to seeing the finished product. One of the other goals of the Band and Drum’s annual camp was to develop unit cohesion. To that end, there were several team building exercises laid on throughout the two weeks. Fortunately, we were invited along to all of them and they included golf, bowling, a production of The Pirates of Penzance and my personal favourite, kayaking along the coastline in the North Atlantic Ocean. To quote Band member Sgt Marie Trott, ‘If you don’t like the weather in Bermuda, just wait ten minutes!’ Unfortunately the weather took a turn for the worse with the arrival of tropical storm ‘Fay’ which battered the Island and sadly resulted in the BPS Tattoo being cancelled. Several members of the Band were also recalled to support the relief effort and the sense of professionalism and team spirit shown by the Regiment at this time was very impressive. So our time in Bermuda had come to an end. Before the Band went their separate ways, we all said our farewells and exchanged gifts. Major Dwight Robinson was hugely appreciative of what the CAMUS STTT had provided to his Band and hopes to host another team in the near future. Thanks must go to Major Dwight Robinson and all members of The Bermuda Regiment that made our trip possible. As this blog is being written, hurricane Gonzalo has just made it to the UK after battering its way through Bermuda. The STTT would just like to take this opportunity to say that we hope that our colleagues in The Bermuda Regiment are safe and continue to perform admirably. 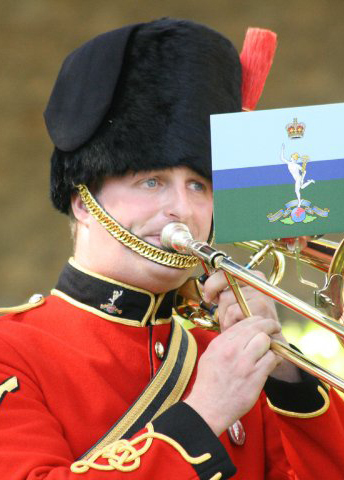 Corporal Simon Lindley is a trombonist and singer in the Corps of Army Music. His current role is Force Development Assistant at the HQ of Army Music. 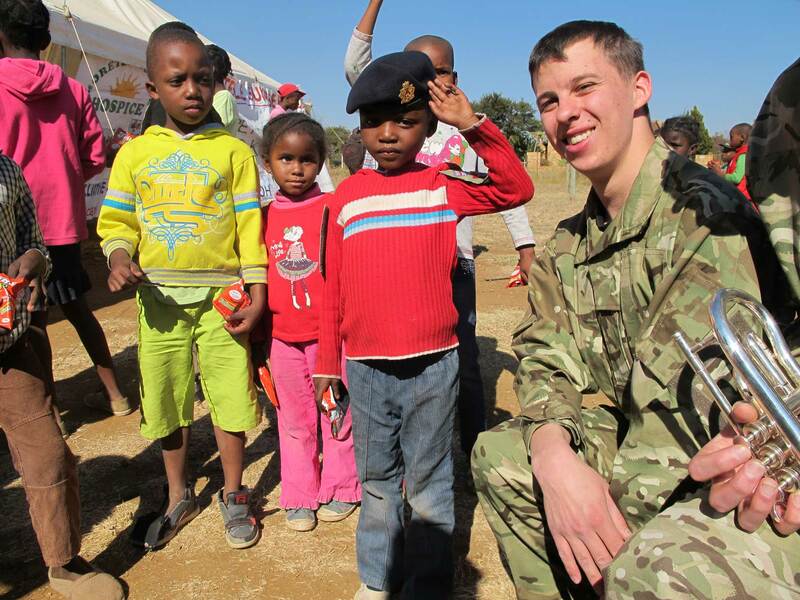 He and a number of other members of the Corps of Army Music recently went to Malawi, Botswana and South Africa as part of a short term training team to help develop the musical capabilities of the Armed Forces in those countries. 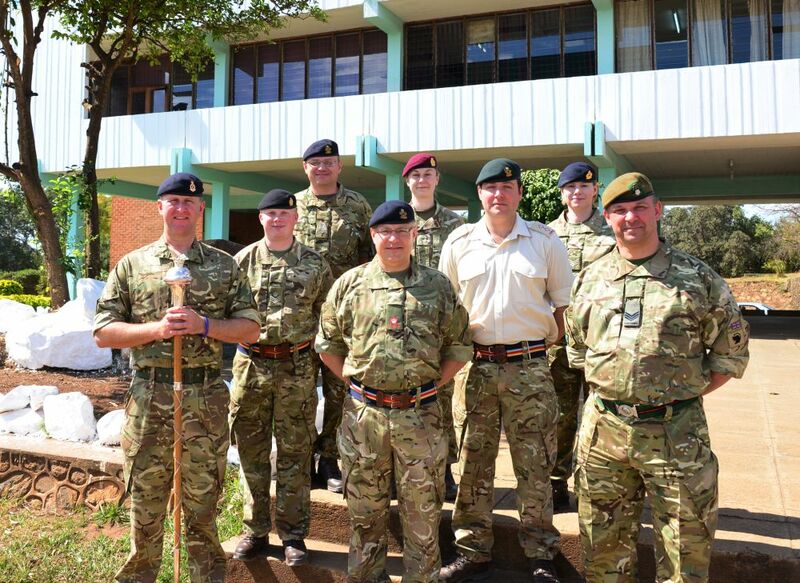 The Corps of Army Music Short Term Training Team (STTT) led by Warrant Officer Class One Shane O’Neill arrived in Lilongwe, Malawi after a 14-hour flight via Johannesburg. With lots of queuing in airports in between, we finally arrived at the Sunbird Hotel, where the team relaxed and prepared for a rewarding 2 days work with The Malawi Defence Force Band (MDF Band). The team arrived at the 2nd Battalion Malawi Defence Force camp in Lilongwe, home of the MDF band and were introduced by their Director of Music, Captain Levison Chisambi, himself a graduate of the Royal Military School of Music Bandmasters course. The team quickly became acquainted with members of the Band and sat down to join in with their full band rehearsal. Part way through the morning the OCs of both our team and the MDF Band left to go on a recce for a joint engagement for a charity golf event for the Malawi War Veterans charity. Rehearsals for the engagement continued under the direction of Sergeant John Storey and myself. After lunch we each took sectional rehearsals of the MDF Band working on music for the engagement, as well as covering some basic musicianship skills, and answering questions on a variety of subjects. After a hard day’s work we returned to the hotel for a well-earned rest. With part of the day free before the engagement at the British High Commissioner’s residence the we took the opportunity to visit Lake Malawi, which was an amazing site and also visited a local village community market and saw first-hand the talented people had carved wooden gifts to sell for their community. After returning to Lilongwe the team headed to work where both the brass quintet and the wind quartet provided musical entertainment to all the guests as well as performing the all important national anthems of Malawi and Great Britain. We were then invited to enjoy some fish and chips and chatted with various guests before retiring to the hotel. A second day of training with the MDF band went ahead, with final preparations for Saturday’s joint engagement being the focus. After a full band rehearsal the team again took sectional rehearsals continuing to work with the MDF Band on music as well as covering instrumental maintenance. At the end of the day the team all had photos with our new friends in the MDF Band. The War Veterans Commemoration Event at Lilongwe golf club, which was attended by many senior MDF officers as well as the British High Commissioner and the newly elected Vice President of Malawi, was a great success. The band provided musical entertainment all morning on the 18th green and then further music was provided during dinner by the wind quartet. At the end of this joint engagement with the MDF Band, the team said fond farewells to our new friends in the MDF band and returned to the hotel to pack for the drive to Blantyre in southern Malawi. Next day we packed up and headed off in our two trusty vehicles fully loaded with bags and instruments on the six-hour drive to Blantyre… After some excellent navigation, we arrived 9 hours later with 4 tired drivers who had to show their off road skills on multiple occasions and good use of the emergency stop to avoid goats that appeared to have suicidal tendencies as we travelled through the country. After checking in to our second hotel, the team settled for the evening. On the 9th June we went to Blantyre hospital to work with the Sound Seekers Charity providing music for the event and working with hearing impaired people helping them to have fun and express themselves with various musical instruments, a very worthwhile cause and a satisfying day was had by all. Arriving safely in Johannesburg after flying from Blantyre, the wind quartet were straight out on an engagement, at the British High Commissioner’s residence in Pretoria whilst the rest of the team enjoyed their new surroundings. 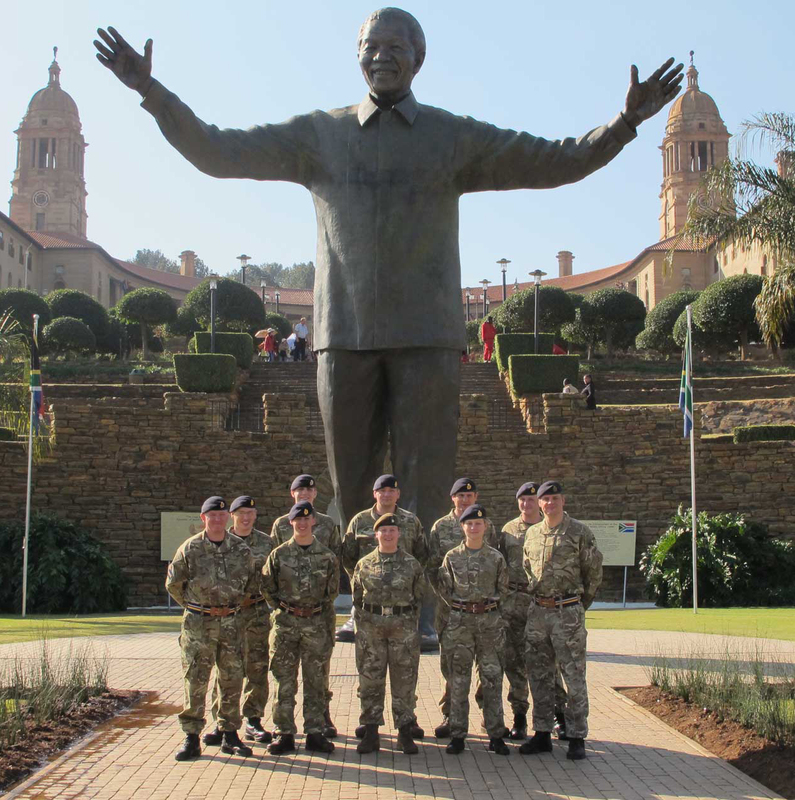 The team met with the South African National Defence Force Ceremonial Guards Band based in Pretoria for a day of training. After watching the Band perform a marching display and small ensemble performance we and the SANDF CG Band joined up for full band rehearsal under the direction of our Bandmaster and enjoyed another successful day. There is a high degree of satisfaction when both the training and rehearsals go so well. On 12th June the brass quintet performed at the British High Commission in Pretoria over lunch before the whole team headed to the Soweto Theatre to spend the afternoon working with local musicians. Next day, with part of the day free, the team took the opportunity to take in some of the recent history of South Africa visiting the Constitution Hill Museum and Court and learning much about the country’s transition from apartheid to democracy. Later that evening we supported another Dinner Night before retiring for the evening. The next day we began the drive north towards Botswana stopping en route to spend part of the day with Modderspruit Sunrise Hospice who work with children and families living with HIV and Aids. This was without doubt the most harrowing and moving part of the whole trip, but it was a privilege to be able to provide a little entertainment and ‘musical therapy’ for the children and families living with this disease. The end of the visit culminated in the performance of the British and South African National Anthems, the children gathered together and sang their anthem as we played. Having performed anthems at both Wembley and Twickenham, I can guarantee that these pale in comparison to the passion and energy for life that the children sang with. Very moving. Before continuing on to Botswana, the team took the chance to go on an early-morning game drive taking in some of the wildlife of South Africa in their own environment. After enjoying the spectacular sights and sounds, the team continued the journey to Garbarone in Botswana, arriving at the hotel late in the afternoon. 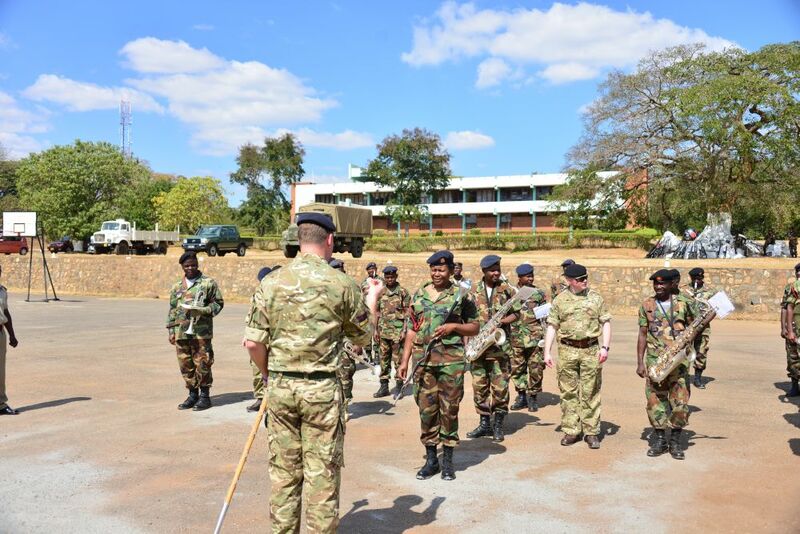 On the 16th June the team spent the day with the Botswana Defence Force (BDF) Band Garbarone, after introductions the team assisted with an Officer Commissioning Parade rehearsal and provided feedback to the band afterwards. In the afternoon the bandmaster took a full band rehearsal of the parade music, then later in the evening the team joined with the BDF Band performing a concert for the Officer Cadets. Next day it was the turn of the brass quintet who performed at a Queen’s Birthday Party at the British High Commission enjoying some traditional British food and providing background music. Our final day of training with the BDF Band proved to be an interesting one, despite major issues with a power cut the team still managed to provide some tuition to the various sections of the band. The team were later taken on a tour of the BDF zoo where they keep animals for the purposes of training and educating their soldiers about wildlife they may encounter in the field. After leaving presentations and photos with the BDF Band the team headed back to the hotel for a final meal and to pack for the journey home. 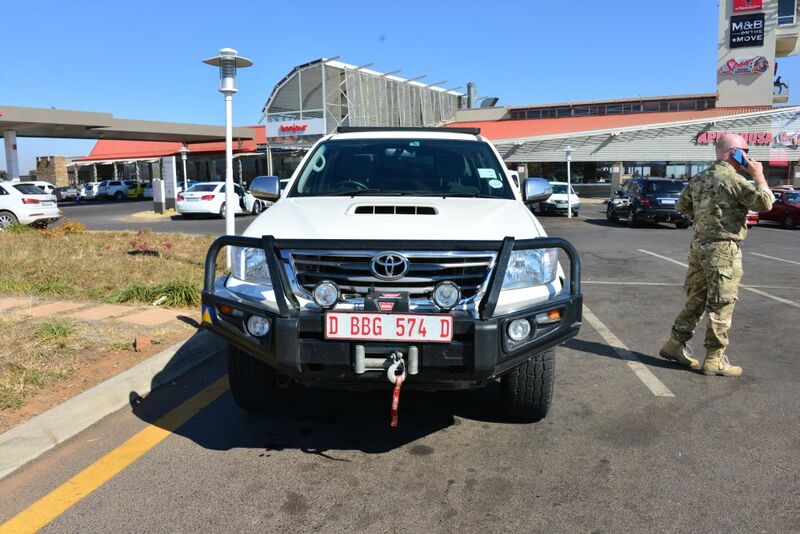 The team packed up the vehicles and drove from Botswana back to Johannesburg for the flight back to the UK. The team arrived home full of amazing memories, life-changing events and feeling thoroughly satisfied that we had completed the trip and leaving the musicians we trained with plenty of new skills and things to think about over the coming months. 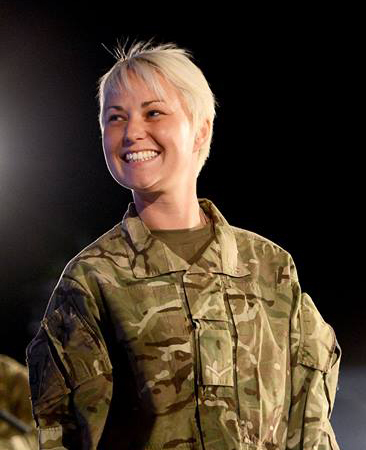 Lance Corporal Suzy Pearce is a singer in the Band of the Army Air Corps, one of the newly formed Rock and Pop Bands of the Corps of Army Music. 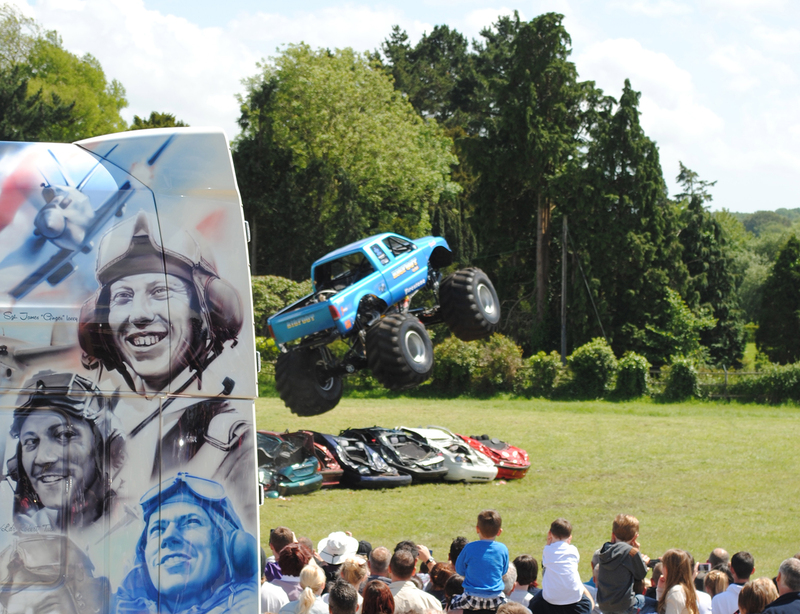 The Band were recently centre stage along with the monster trucks at this year’s TRUCKMANIA at Beaulieu, where the Army was also showing off some of its vehicles to the public. 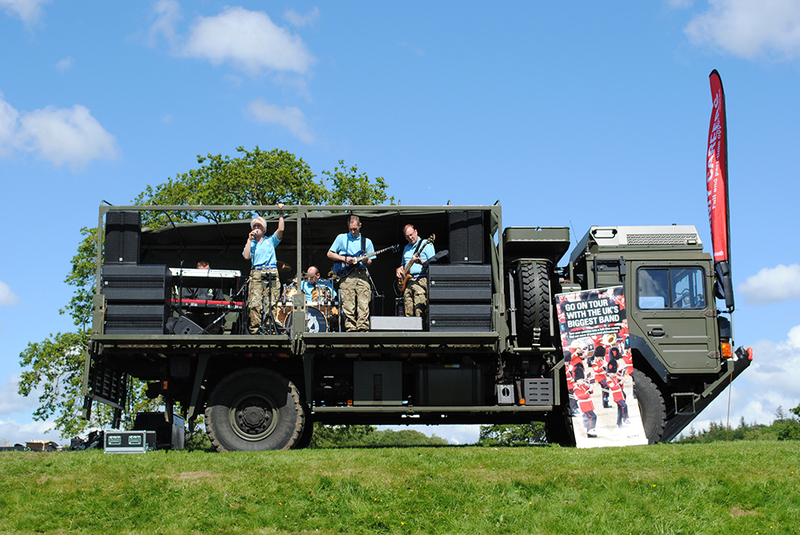 On Saturday 24 May the Band of the Army Air Corps (Corps of Army Music) travelled down to Beaulieu Motor Museum in Hampshire in order to provide musical support to “Truckmania” alongside other Army recruiting agencies. We were appointed a troop carrying vehicle which was parked on a grassy bank facing the main arena alongside the rest of the Army trucks, and there we began unloading. Bands are often faced with problems when it comes to outside engagements, the weather being the most obvious, but today the sun was on our side, however, the lack of power was not. The question “Do you need power?” which came as the PA, amps, monitors, drum kit, guitars and keyboards got hauled onto the truck did cause a heavy silence and disbelieving glances throughout the band, but in true Army style a generator was produced from somewhere and we were able to continue unfazed. With the sound check complete we retired back to barracks to relax before the main event. The gates opened at 10am on Sunday and the first truck the public encountered as they walked in was Optimus Prime from Transformers. Although it may not transform, it brought a smile to many an adult and childs face, as did the fancy dress Bubblebee happily posing with families. 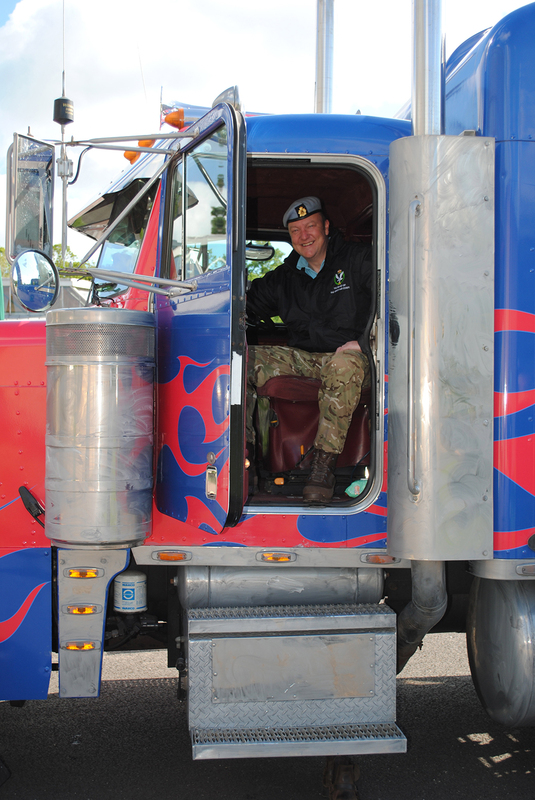 Even our Band Sergeant Major was eager to get his picture taken in Optimus Prime’s driver’s seat. Back in the Army area, people enjoyed looking at the various trucks and rocket launcher, although a clear favourite was the inflatable assault course which attracted quite a few excitable children…and dads. One of the main events of the day was the awesome ‘Big Foot’, whose massive tyres effortlessly crushed the scrap cars which had been lined up for sacrifice. The crowd cheered enthusiastically every time Big Foot trampled them further into the ground, although there was a chuckle when one of the (now flat) estate car boot’s slowly opened in an act of defiance towards the end. Throughout the day our musical sets were accompanied by revving engines, air horns and the hum of generators around us. The only unwanted sound was the silence of our own power supply when it inconveniently decided to take a break just before our last set. Luckily an engineer was on hand to help us and we began for the final time that day, much to the relief of our Bandmaster and the crowd that had stopped to sit on the grass and listen to us. It was particularly rousing to see the other members of the Army climb on top of their trucks and take a break for a little while to enjoy the music and clap along. Bank holiday Monday began with high morale at breakfast as the band assessed each others windburn from the day before. Unfortunately, the weather was too bad to play our first set of the day, so we took the time to visit the National Motor Museum which holds over 250 motor vehicles, reflecting the history of the car on the roads and circuits of Britain. One car which particularly caught the eye of visitors was “Chitty Chitty Bang Bang” from Ian Fleming’s classic children’s book, complete with the wings folded underneath. Spectators armed with multi-coloured waterproofs seemed undeterred by the rain and continued to enjoy the activities available. These ranged from Mini Truck World in the Grand Marquee where remote controlled vehicles could be seen in action, to the free dodgems which were also a highlight. By lunchtime the rain had permanently set in, so the sponsors decided that due to health and safety reasons we were best to pack down and get on our way before the ground became too churned up to leave. It was unfortunate that we were unable to give further musical support to the other Army stands who were continuing to work hard in Gortex, but we were still pleased with the response we had gained the day before. It was a great opportunity to participate in such an enthusiastically received event. We were able to demonstrate the new capabilities of the Corps of Army Music to both public and Army alike and we look forward to continuing this at similar events in the future.